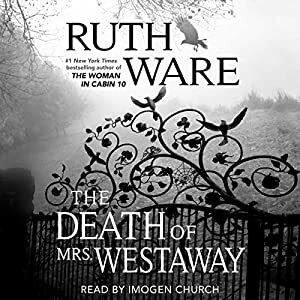 This is now my favorite Ruth Ware book, by far (I’ve read and liked them all). It drew me in from the very first page and didn’t let me go. I tried to read it slowly — after pre-ordering and anticipating it for months — but ended up binge reading it. The suspense and subtle dread. I had to know what the next page held. The great character study. A classic whodunnit. Was it him? Her? Him? Who?! I truly didn’t know until the end. The twists and red herrings were perfectly done … not exploiting the reader at all, but how the story moved organically. They made complete sense, and that’s rare nowadays in this genre. I also loved how, even though Mrs Westaway had passed on, her presence was still felt so menacingly and strongly. I mean, yes, the book centered around her actions … but instead of her being a vague idea, this cloud of doom, I felt like she might actually come around the corner at any time. The housekeeper, of course, did do just that, often, and was quite the scary character! Not in a cheesy way, no, the tension and malignancy she brought was very well done. I love family sagas, especially about old English families and estates, and this certainly delivered that! The wonderful descriptions of the mood and setting. I felt like I was there, in that cold, drafty old house that held so many secrets and heartache. My only minor complaint about that — I would’ve liked a bit more closure regarding the attic room and how a certain someone in the past was basically held prisoner there. The emotions! Hal is so likable, so strong, yet vulnerable. I desperately wanted things to get better for her. I cheered her on and felt what she felt. And then the family — a mixture of both sympathy and, “One or more of you is the bad person(s) here, so I’m hesitant to like you or feel compassion”. It’s fun not knowing. Ms Ware shaped them all so well, letting the reader come to their own conclusions, nothing was overtly obvious. So many books in this genre fall into cliches; this one never did. And I like how the family grappled at first with embracing Hal … this complete stranger thrust into their lives/complicated emotions regarding their mother, her death, and the house. That aspect was another so well done. I liked them all for most of the book, but again, knew evil lurked among them, and knew some of my sympathy would be wasted at some point. The side story with Hal and the loan sharks. Fear for her. The great research Ms Ware must have done, and included, about Tarot cards/readings. Not a subject I’ve ever believed or had much interest in, but wow, I really got into it more and more … and the explanations of how Hal and her mother didn’t take it literally, but could read them figuratively. It was so fascinating to me. The ending was great. I won’t say more, just that it was satisfying in many ways. Again, rare for this genre. It makes me wish I was in a book club, I want to discuss this book with others! Thank you, Ms Ware, for such an entertaining book! It was well worth the wait. I’m just sad it’s over and that we won’t get to see how young Hal’s life turned out afterwards. I’ll miss her and the family (well, some of them). I highly recommend this book to anyone, not just psychological suspense fans. And I really think this would make a great movie! Outstanding. Ever read a book that You could not put down? One wherein You made a silent plea for your eyes to stay open? This is one of those books. Must admit, I found Ware’s first three novels to be “eh”. However. She has most definitely honed her craft with this one. I respectfully disagree with those reviewers who describe this one as being psychologically thrilling, although the backdrop is deliciously dark and gothic. This is more of a Who Did What and What Is Going On Here novel. From the moment I read the first page, I was hooked. Thank you Ms. Ware for the wonderful, wonderful visit. Definitely Ware’s best, so far. I had reasoned the father of Hal early on, but the mystery that entombed her, of that I had no clue. I learned while reading, learned of tarot cards, the silliness of them, the truth each wants to hear, to believe. Thank you Ruth Ware for scaring the bejeebers out of me. FYI I have a limited amount of bejeebers to spare.